Home Publications Briefings Whose Hajj is it anyway? Whose Hajj is it anyway? The pilgrimage to Makkah (Mecca) is obligatory for all Muslims who can make the journey. The physical act of going to Makkah to be in the company of Muslims from all over the world, of all backgrounds, worshipping the same God, based on the same message of the Prophet Mohammad (peace and blessings of Allah be upon him) and following the same guidance in the same holy book makes Hajj a unique feature of Islam. Historians and scholars have noted how “[I]slamic cultural unity and solidarity, a tangible sense of being an umma, were very largely created by the hajj.” The unity created amongst such a pluralistic body is something to be celebrated and protected. After all, Allah says in the Quran “O mankind, indeed We have created you from male and female and made you peoples and tribes that you may know one another.” Unity is thus a key value within Islam. Unfortunately, under Saudi supervision, this unity has not been preserved, nor has the management of Hajj been anywhere near adequate. It is worth remembering that Makkah was not always part of the entity known as Saudi Arabia. Ibn Saud, the founder of Saudi Arabia, invaded Hejaz in 1924, which was then ruled by Hashemite King Hussain bin Ali, himself the second Sheriff of the city during the short period of the Kingdom of the Hejaz (1915 – 1926) having taken over at the collapse of the Ottoman administration. Having taken control of the land, Saudi Arabia was then established in 1932. As King Hussain fell out of favour with the British because he was unwilling to accept the Anglo-French mandate within the region, the British came to accept and support Ibn Saud with his followers. This typifies the ‘divide and rule’ approach of the colonial powers of the time and provides an important context for how the formation of the state of Saudi Arabia is rooted in conquest, personal ambition, and wider geo-political interests. Of course, in and of itself the “nation-States framework… is designed to make permanent the division of the Ummah, whereas the objective of Hajj is to unite the Muslims”. In a post-colonial world, then, where the primary form of political, social and economic organisation is the nation state, the importance of transcending borders to ensure collective Muslim ownership of Hajj, a common religious institution, must be stressed. Along with the circumstances in which Saudi Arabia was born, the nature of this monarchy demonstrates that it is hardly suited to serve the international Muslim community as protector of the Holy Cities. Prior to Saudi control, “the interpretation of Islam held by the ruler of Makkah… did not generally affect pilgrims.” In contrast, under Saudi rule, Wahhabism is the official doctrine of the regime and its approach has been imposed on pilgrims. Initially, resistance to Wahhabi policies was witnessed to the point where Ibn Saud had to actually persuade pilgrims to perform the first Hajj under his rule. Cultural practices that existed for centuries have stopped altogether under Saudi rule. For example, the Egyptians had traditionally sent a ‘mahmal’ to Makkah. This was a ceremonial centrepiece festively carried on a camel through the streets of Cairo before being taken to Makkah. It was accompanied by a brass band. However, British officials had requested in the 1920s that the Egyptian government not send this because of Wahhabi opposition to such practices. Ultimately, there was a physical clash between Egyptians carrying the ‘mahmal’ and Saudis and after 1926 the tradition of carrying the ‘mahmal’ to Makkah ended. Tombs and houses of those revered by Muslims of all sects have been destroyed because the practice of visiting such places is deemed idolatrous according to state sanctioned Wahhabism. Most Muslims will be aware that the house of the Prophet’s first wife, Khadijah, has been turned into public toilets. In 1998, the grave of the Prophet’s mother, Amina bint Wahb, was bulldozed and gasoline was poured on it. Over 98% of Saudi Arabia’s historical and religious sites have been destroyed since 1985 according to the Islamic Heritage Research Foundation. These sites need to be preserved in order to understand our shared Islamic history. Last year saw two tragedies unfold in Makkah. Firstly, a crane collapsed leaving more than 100 dead and over 200 injured. Some have suggested that Saudi authorities were negligent for having a series of cranes overlooking the Grand Mosque in the first place. The second incident was the horrific human crush at Mina. A count done by Associated Press, using official and state news reports from 36 countries which had pilgrims in Makkah at the time, found that more than 2,400 people died. However, Saudi authorities still claim that the official death toll is 769. To this day, Saudi officials have not released any details about an investigation into the cause of the tragedy. In fact, Saudi Arabia’s most senior cleric deflected all responsibility away from Saudi authorities when he told the crown prince that Saudi leaders had carried out their duties fully. It would be one thing if the mismanagement and negligence on the part of Saudi authorities seen last year was an isolated incident. Unfortunately, this is not the case. In 1990, a crush in a tunnel in Mina killed 1,426 pilgrims. In 1994, 270 pilgrims were killed during the stoning ritual. In 1998, more than 100 people were killed in another crush at Mina. Further crushes occurred in 2001 and 2004. In addition, over 400 died in 1987 when Saudi security forces attacked pilgrims in Makkah, mainly from Iran, who were protesting peacefully against the USA and Israel. Sadly, history keeps repeating itself as the Saudi regime continues, without serious reproach from a united Ummah or the international community more broadly, to mismanage Hajj and neglect its responsibility as the self-appointed custodian of the two Holy Mosques. In the past, the management of Hajj both politically and economically was less centralised. For example, under the Ottoman caliphate, Ottoman rulers cooperated with ‘sherifs’ in Hijaz, who held power locally. In addition, ‘kadis’ of Makkah and Medina were appointed, along with an administrator for Jeddah and other lesser officials. Power was therefore spread across various bases. Economically, a large part of funds sent to Hijaz for the facilitation of Hajj came from religious foundations, ‘waqfs’. Each province, including those with autonomous status, within the Ottoman empire maintained waqfs. For example, in 1830, Algiers had 1,748 properties set up as ‘wafq al-haramayn’, providing revenue for the two Holy Mosques. Between 1880 and 1924 Egypt provided an average annual amount of 53,350 Egyptian pounds. Thus, there have been ways of managing Hajj, politically and economically that have been more pluralistic in nature than the way Hajj is currently administered. To this end the Islamic Human Rights Commission’s primary recommendation is that governments across Muslim countries unite to establish a framework whereby Muslim countries can each participate collectively in Hajj management. Utilising the Islamic concept of ‘waqf’, each country should be considered a trustee in relation to the administration of Hajj, owing a legal duty to administer the Hajj for the benefit of all pilgrims. In addition, the Islamic Human Rights Commission recommends that an international investigation is conducted by a committee comprising representatives across Islamic countries and technical experts, identifying the causes of the crush in Mina in 2015 specifically, as well as identifying structural reasons for repeated crushes historically during Hajj. IHRC repeats its call for a technical commission to be convened to bring expertise in the field of large events management, in particular but not solely from Turkey, Iran and Iraq where events larger than the annual Hajj are regularly held without major incident. The reluctance on the part of Muslims to speak openly about Saudi Arabia is testament to the way in which the Saudi regime uses its power to control the narrative. For example, following the 2015 Mina crush, the Pakistani government told the country’s media not to criticise the Saudi government. Pakistan is of course a large recipient of aid from Saudi Arabia. Turkey’s President Erdogan also defended Saudi authorities after the Mina crush. This came at a time of deepening political relations between Saudi Arabia and Turkey, including a decision to establish a ‘strategic cooperation council’ between the two countries, focusing on military, economic and investment ties. On the other hand, officials from the governments of Indonesia and Bangladesh did openly criticise Saudi authorities for the way they handled the aftermath of the crush. Nigeria and Iran also called for an international investigation into the crush. The irony is that Saudi Arabia then accuses those who advocate an international response or some form of shared responsibility across Muslim countries for Hajj of politicising the pilgrimage. The desire to have a safe and inclusive Hajj is not part of a political agenda but an attempt to realise the divine messages within the Quran. Allah says “We have rendered the shrine (the Ka’aba) a focal point for the people, and a safe sanctuary.” Clearly then, the Ka’aba is “for the people”, the Muslim community as a whole. It is not owned by the Saudi government or any government but is administered on behalf of and in service to Muslims world-wide. It is meant to be a “safe sanctuary” but events such as the 2015 Mina crush show that under Saudi supervision, it has been anything other than that. It is time that Muslims around the world unite to make Makkah, and this most holy of religious events, Hajj, a “safe sanctuary” for all pilgrims. Pearson, M. N. (1994).Pious passengers: The Hajj in earlier times. London: Hurst . Bangash, Z. (1988). The Makkah massacre and future of the Haramain. London: Open Press. . Slight (see fn 3) . Egypt and the Mahmal. (n.d.). Retrieved 13 September 2016 from The British Museum website, http://www.britishmuseum.org/explore/themes/hajj/the_journey/routes/the_african_route/egypt_and_the_mahmal.aspx. Sardar, Z. (2014, September 30). The Destruction of Makkah. The New York Times, Opinion Page. Retrieved from http://www.nytimes.com/2014/10/01/opinion/the-destruction-of-Makkah.html?_r=0. Al Alawi, I. (2006, January 1). The Destruction of the Holy Sites in Makkah and Medina. The Islamic Monthly. Retrieved from http://theislamicmonthly.com/the-destruction-of-the-holy-sites-in-Makkah-and-medina/. Power, C. (2014, November 14). Saudi Arabia Bulldozes Over Its Heritage. Time. Retrieved from http://time.com/3584585/saudi-arabia-bulldozes-over-its-heritage/. Abdul Majid Daryabadi, Safar-e Hijaz (Azamgarh, Uttar Pradesh: Maarif Press, 1929), 111-122, quoted in Bose, S. (2006). A hundred horizons: The Indian Ocean in the age of global empire. Cambridge, Mass: Harvard University Press . Irfan Al-Alawi, co-founder of Islamic Heritage Research Foundation quoted in Rawlinson, K and Chulov, M. (2015, September 12). Hajj pilgrimage to go ahead despite tragic crane collapse at Makkah’s Grand Mosque. The Guardian. Retrieved from https://www.theguardian.com/world/2015/sep/11/crane-crashes-grand-mosque-Makkah-haj-pilgrimage. Gambrell, J. (2015, December 10). AP count: Over 2,400 killed in Saudi hajj stampede, crush. Associated Press – The Big Story. Retrieved from http://bigstory.ap.org/article/3a42a7733a8b476889bb4b7b3be3560e/ap-count-over-2400-killed-saudi-hajj-stampede-crush. Dearden, L. (2015, September 26). Hajj stampede: Saudi Arabia’s religious leader says authorities not at fault because ‘fate and destiny are inevitable’. Independent. 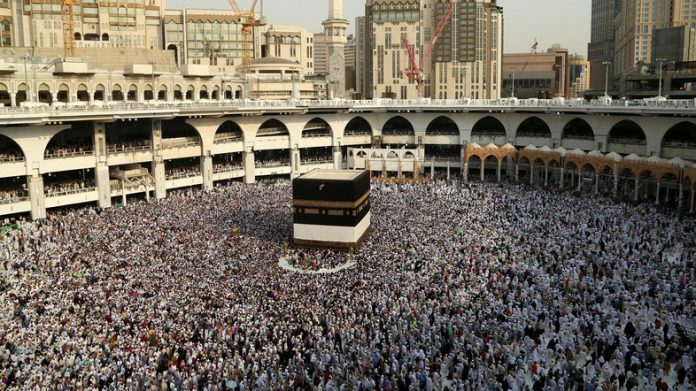 Retrieved from http://www.independent.co.uk/news/world/middle-east/hajj-stampede-saudi-arabias-religious-leader-says-authorities-not-at-fault-because-fate-and-destiny-a6668271.html. Berkhead, S. (n.d.). Sadaf Baig, Pakistan. Journalists discuss their hopes for press freedom in 2016. Retrieved from http://journalists-discuss-their-hopes-for-press.silk.co/page/Sadaf-Baig-Pakistan and Masood, S. (2015, October 6). Hajj Stampede Tarnishes Saudis’ Image in Pakistan. The New York Times. Retrieved from http://www.nytimes.com/2015/10/07/world/asia/pakistani-pilgrims-hajj-stampede-saudi-arabia.html?mtrref=undefined. Zuhur, S. (2011). Middle East in Focus: Saudi Arabia. California: ABC-CLIO. [125-127]. Dhaka in dark about handover of bodies. (2015, October 12). The Daily Star. Retrieved from http://www.thedailystar.net/frontpage/dhaka-dark-about-handover-bodies-155710; Indonesia criticises Saudi Arabia for hajj disaster response. (2015, September 29). The New Arab. Retrieved from https://www.alaraby.co.uk/english/news/2015/9/29/indonesia-criticises-saudi-arabia-for-hajj-disaster-response. Hajj Stampede: House, NLC call for thorough investigation. (n.d.). TV 360 Nigeria. Retrieved from http://www.tv360nigeria.com/hajj-stampede-house-nlc-call-for-thorough-investigation/; Leader urges international investigation into Hajj tragedy. (2016, September 7). Tehran Times. Retrieved from http://www.tehrantimes.com/print/406214/Leader-urges-international-investigation-into-Hajj-tragedy. Saudis accuse Iran of playing politics with the hajj tragedy. (2015, September 27). Ya Libnan. Retrieved from http://yalibnan.com/2015/09/27/saudis-accuse-iran-of-playing-politics-with-the-hajj-tragedy/.